Other Common Names: Featherfew, featherfoil, flirtwort, bachelor’s buttons, bride’s buttons, febrifuge plant, pyrethrum, wild chamomile, midsummer daisy, camomille grande (French), altamisa (Spanish), reunuspäivänkakkara (Finnish), Mutterkraut (German), matrem (Danish). 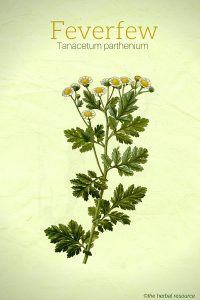 Habitat: Feverfew is native to southeastern Europe, but is found throughout Europe, Australia, and North America today. This herbaceous plant prefers rich, well-drained soil with a loamy, stiff character to it. Plant Description: Feverfew is a perennial plant belonging to the daisy family (Asteraceae or Compositae) that can reach up to 60 cm in height. The stems are stiff, furrowed and highly branched. The leaves are bright green, hairless and alternate. The plant blooms from July to October producing flowers that resemble small daisy flowers. Both leaves and flowers have a strong scent. Plant Parts Used: All of the above-ground parts of the plant may be used for medicinal purposes. The dried leaves are the most commonly used parts. It should be noted that when the plant is dried it may lose some or most of its medicinal effect so when it is intended as a medicinal plant the fresh leaves or standardized preparations should be preferred. Active Ingredient and Substances: Feverfew contains sesquiterpene lactones (mainly parthenolide), flavonoids, essential oil, pyrethrin, and tannins. The concentration of parthenolide varies widely and depends on the plant’s geographical origin, harvest time, drying and storage. Feverfew got its name from the traditional use for treating fevers by bringing down the temperature and help the fever to “break.” and because the plant also had the reputation of being an effective remedy for headaches and migraine, scientists believe that substances found in the herb might act in a similar way as aspirin. Aspirin, contains acetylsalicylic acid, a substance that has been shown to be effective in the treatment of pain. Aspirin acts by inhibiting the production of substances in the body called prostaglandins. They are present in very small amounts in the body but when the levels increase, they affect the nerve endings and thereby causing pain. There are many types of prostaglandins, and they have several different functions like involvement in inflammatory processes. The chemical substance parthenolide found in feverfew is thought to inhibit the production of prostaglandins in a similar way as acetylsalicylic acid. Some small clinical studies seem to confirm the usefulness of the herb as a treatment for a migraine. 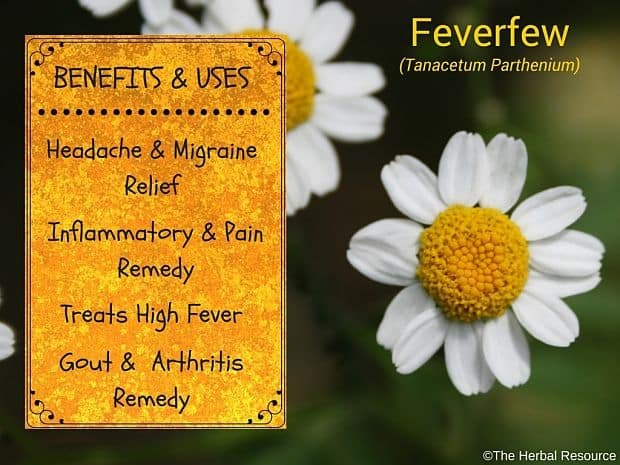 In addition, studies have shown that feverfew appears only effective as a long-term treatment and that it is only marginally useful as an immediate relief. Clinical trials have shown that it can take up to four to six weeks for the herb to work but that varies greatly from person to person. 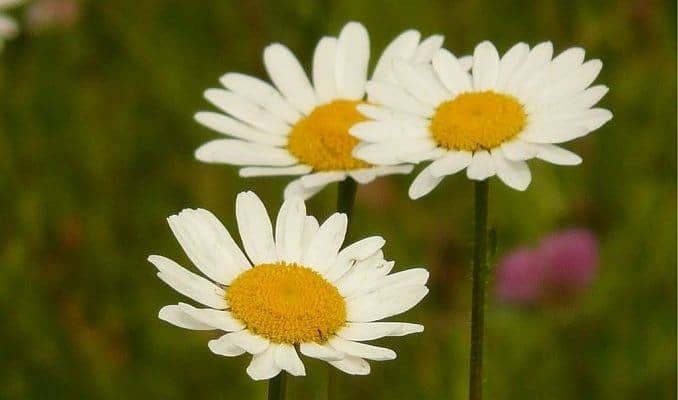 It appears that feverfew does not work for everybody and bigger and more detailed studies are needed to firmly confirm the effectiveness of feverfew as a migraine treatment. The substance parthenolide found in feverfew appears not only to inhibit prostaglandins but may also have other beneficial health properties which could explain a variety of the other traditional medicinal uses that are associated with the herb. Feverfew is considered to have carminative (gas relief), purgative (strong laxative), stimulant, and anti-inflammatory properties. Clinical studies indicate that the plant may be useful as a treatment for nausea, gout and arthritis pain and that it may promote a restful sleep, stimulate digestion and curb the strength of asthma attacks. Some users claim that feverfew has helped them overcome depression, which is consistent with one of the traditional use of the plant. The herb has also shown promise in reducing menstrual pain, menstrual cramps and promoting menstrual flow. 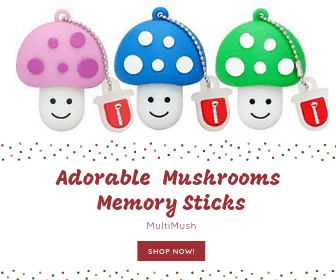 For Headaches: 100 to 300 milligrams up to four times daily, of a supplement standardized to 0.2-0.4% parthenolide, can be taken to relieve headache symptoms. 1-4 fresh leaves may be chewed to relieve headache pain as well. For inflammatory and pain relief applications: The same dosage may be used for this application, although many people prefer the liquid extract taken at 60 to 120 drops twice daily. Side effects of feverfew use may include abdominal pain, nausea, vomiting, indigestion, flatulence, diarrhea, and nervousness. Chewing the raw leaves of the feverfew plant may cause mouth ulcers, swelling of the structures of the oral cavity and loss of taste. Allergic reactions are rare but do occur. Individuals with bleeding disorders or who take blood-thinning medications should not take it due to the possibility of bleeding complications. Pregnant and nursing women should not take this herb. This herb is also not recommended for children, especially those under 2 years of age. Fetrow, Charles W. & Juan R. Avila: Professional’s Handbook of Complementary & Alternative Medicine. Springhouse, Pennsylavania, Springhouse Corporation 1999. Foster, Steven: Herbs for Your Health. A handy guide for knowing and using 50 common herbs. Loveland, Colorado, Interweave Press 1996. Hancock, Ken: Feverfew, Your Headache may be over. New Canaan, Keats Publishing 1986. Hoffmann, David: Natural Relief from Headaches, Insomnia & Stress. Safe, Effective Herbal Remedies. Los Angeles, Keats Publishing 1999. Skidmore-Roth, Linda: Mosby’s Handbook of Herbs & Natural Supplements. St. Louis, Mosby 2001.